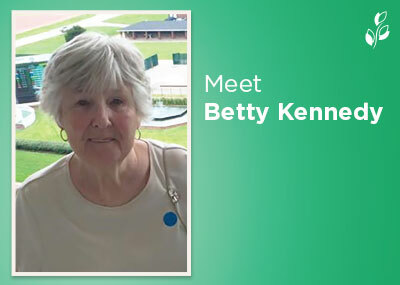 Bette Kennedy had no idea what was in store for her when she joined Brookdale Blankenbaker, in Louisville, KY just one year ago. A former kindergarten teacher, Kennedy had spent many years of her life investing and teaching younger generations. She led an enrichment program for the public schools that took students on tours to Washington, DC and other historic sites. She also spent many years as a docent for the historical society in Fredericksburg, Virginia. She gave tours of The Rising Sun Tavern, Apothecary Shop, and the Mary Washington House. Now as a Brookdale resident, she’s found new ways to help others, and she shares what her experience has been like at Brookdale Blankenbaker. Q: What do you love most about your community? Q: What features helped you determine your community was right for you? My son, Tom, found Brookdale Blankenbaker for me. My favorite features are the atmosphere of the interior and the grounds outside. Q: What was most difficult about selecting a senior living community? I had many friends living in a senior community in Virginia. I visited them often to play cards and felt that it was a good environment to be in. I knew I could not stay in my home forever, so I put my trust in my son to find just the right place. Q: Do you participate in activities, outings, or groups/clubs at your community? If so, which ones? I’m a member of the Resident Council, Ambassador Committee, Walking Club and exercise classes, including B-Fit, Yoga, Tai chi and Spiro 100 classes. I also help with service projects — we just put together 60 Easter baskets for Maryhurst, a girls’ home. I also enjoy games such as Bridge, Rummikub and Bingo as well as the Big Band dances held often, all the theme parties and Brookdale Celebrates monthly events. Q: What would you tell someone considering your community — or moving to a senior living community in general? Just be open-minded. Jump in, and be involved. Be open to the opportunities you have in your new life. Q: What should they know before making a decision? Commit to it fully and with an open mind. You can have a wonderful life or a miserable one; it will be what you make it. Q: What have you learned about yourself since moving to your community? I can’t quite answer that, I’ve known me a long time, but I have discovered I find joy in watching a family of geese and their seven goslings who have taken up residence in our pond. Q: Do you have any additional advice, words of wisdom or thoughts you’d like to share? Be open to your new opportunities for friendship, activities and growth in your life. When Is the Best Time to Start Planning for Retirement? © 2019Brook Dale | Proudly powered by WordPress | Theme by Theme Farmer.